Maharat Foundation and DW Akademie held today a workshop entitled “Media and Innovation: Opportunities for Sustainability of Independent Media Startups” the workshop will last 2 days and is being held at “Antwork” space in Spears-Beirut. During the workshop, the organizers launched the Digital Media Viability Lab project and its training program on Media Management. The workshop gathered local and international experts in media development especially in the field of supporting media startups and successful and sustainable business models. The workshop aimed at discussing available opportunities in Lebanon in regards to developing the culture of innovation and entrepreneurship in media. The sessions provided practical case studies for innovative business models that have generated profits. The first session discussed the question of “why do we need to build capacities around digital media viability?” The session started with the Executive Director of Maharat Foundation Roula Mikhael where she explained Maharat’s vision of the Digital Media Viability Project that is implemented in partnership with DW Akademie, and stressed on the importance of this workshop that aims at creating a suitable environment for a more free and independent media; highlighting previous contributions conducted by Maharat at the level of law proposals, awareness raising and capacity building. 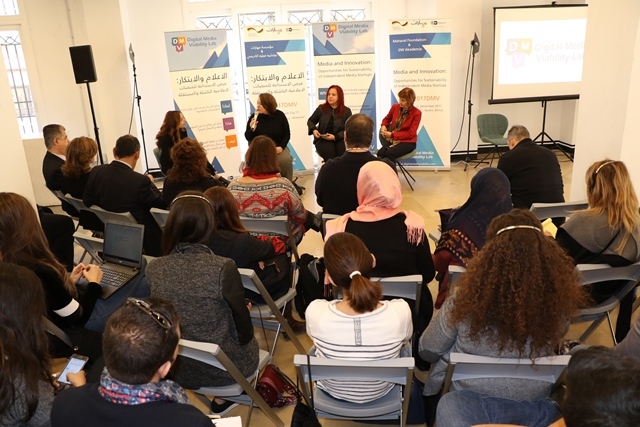 She said “through our experience in Maharat News we noticed that journalists want more independence to reflect their opinion, but there wasn’t any possibility to sustain this experience”. She ensured that there many reasons for that including “lack of elements that are not provided where profit is not given importance, thus we wanted to implement a program to assist current projects to develop business models to sustain their work”. Mikhael emphasized the importance of supporting startups since “there are independent project that were not sustained, but nowadays there is an opportunity to support these platforms, especially through our project aiming at having trainers and journalists capable of developing sustainable projects”. She drew attention to the study that is being developed to understand the challenges and the way of tackling them in partnership with the media faculty at the Lebanese university. The lead trainer of the Media Management training program Tatiana Repkova emphasized the importance of this program because challenges are the same worldwide based on experiences in Ukraine and Belarus. She said: “independent work nowadays is the aim of many enthusiastic journalists. But what is more important than developing a project is to provide time to manage these projects including organization, planning and control, and eliminating any of these elements will lead to the failure of the project”. Repkova said that is important to encourage participants in this program to think about themselves, adding “content is not enough but there are additional elements like profit making, developing strategies, and team management and human resources”. The Deutsche Welle Akademie Country Manager, Sandra Van Edig stressed the importance of providing support for innovative media and said “Lebanon is a suitable country to hold this program, and we will provide support not only for Lebanon but also for the Arab region”. She explained “that the project required a year of preparation and planning and today we have a gender balance in the targeted participants, and it is one of a kind, through which online training will be conducted”. A second session was held discussing what is needed to balance between quality content and a profitable business model. The founder and editor in chief of “Denník N”, Thomas Bella, spoke about the experience of funding a startup newspaper through donation of readers where the costs were 3 hundred thousand Euros, and explained that “monthly fees ranged between 5 and 8 Euros per month allocating articles for contributors and this is what supported the newspaper. We have spent half million euros at the beginning and then we started having profits”. Thomas focused that online subscriptions is the major financial support despite what other newspapers think that readers don’t pay for content online, but actually there are many online readers that do”, he also focused on the importance of content and deep investigations that shows what is known with “the need for Media”. The dean of the Business and International Relations Department at “IAU College, Aix En Provence”, Aboubakr Jamai also participated in this session where he stated that “the Moroccan system managed to acquire our media because it killed the business model that we worked on, the most successful model is constant investigative research. The systems have the resources to control journalistic work, thus we need democracy, freedom, and cultural change. Maybe in Lebanon there is a big hope. We also need content development. There is no sole solution for that. We need training and constant practice”. Jessy Abou Habib, the head of Digital Strategy department at LBCI said that “we want to find balance between the content we publish through social media and what we keep exclusive to our website since statistics show that website visitor surf for 5 or 6 minutes, and the visitors of the website through social media are only 40% of total visitors”. She added “since the website is separate from the TV channel, thus there are many sources of profit including ads, and the innovative ads funded by the advertiser”. As for Veronique Abou Ghazale, Editor in Chief of “Ounoussa” and “Sohati”, and trainer in digital media, she explained about her personal experience of freelance work for 5 years during the financial crisis of media institutions which led to the establishment of her own institution, and she focused on the funding program for entrepreneurship initiatives provided by Bank du Liban BDL, and other funding programs for startups, she said “I focused on providing media services through the Gulf with unemployed graduates from the Lebanese University”. The workshop included a third session entitled “How to capture entrepreneurial opportunities, and how to inspire innovation?” through which the Irish journalist and expert in newsroom innovation, Peter Geoghegan spoke about his experience in Scotland where he contributed in the establishment of a journalistic cooperation that focuses on funding and financial media, and conducting investigations in addition to analysis that is decreasing a lot in Europe. JJ Robinson, from the program on Independent Journalism, in Open Society Foundations considered that “managerial restrictions not the governmental one is what led to closing many media institutions”. He added “we realized that media institutions that are not capable to get finding through Facebook or google they choose ads to reach small audience but it is necessary to start thinking of fundamental change”. The Legal Advisor at “Banque Du Liban, BDL” Ray Yazbek talked about the circular 331 from BDL related to supporting entrepreneurship initiatives, that aims at supporting startups in the technology and innovation sector including media and journalism. Interested youths can apply either through one of the banks or the funding programs that are held in cooperation with specialized organizations to support innovative ideas. The lawyer Nisrine Salhab, specialized in establishing startups, had a legal intervention about the mentality of entrepreneurship and startups, and the process of establishing a firm since this process doesn’t require more than 48 hours and more than one founder which means three persons or more, but usually only one or maximum two people apply and this lead to problems. She said “don’t be afraid to establish a firm and ask for a legal opinion of experienced lawyers and communicate with them all the problems you face”. Dr Ali Rammal, from the Media Faculty at the Lebanese University, talked about entrepreneurship among media students and the integration of technology in educational curricula at the university, he said “we work on developing educational programs constantly, and we require research papers from students about potential projects that can be implemented. Some students take the initiative and face their fears and implement their personal projects”. Rammal stressed on the importance of taking risks stating that quality content fulfil the needs of society, and this requires courage. Then discussion was held during the third session and space was given for participants and journalists to ask their questions and share their opinion.